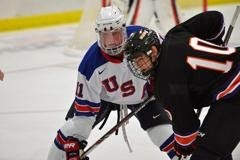 2014 recruit Jack Eichel scored on a breakaway goal and added an assist as Team USA cruised to an 6-2 win over Switzerland in the final game of the Four Nation’s Tournament in Finland. For the second time in the tournament, Eichel was named Team USA Player of the Game. 2014 recruit Johnathan MacLeod also made the scoresheet with a pair of assists. On Saturday, Eichel scored the overtime game-winner in Team USA’s 4-3 victory over host team Finland. Earlier in the game, he assisted on two goals. Eichel now has a 10-10-20 line in 13 games, with nine points coming in the tournament. Blueliner MacLeod has a goal and three assists this season. 2015 recruit Maxim Letunov deflected home a wrist shot by 2014 recruit JJ Piccinich late in the third period, but Youngstown fell short by a goal, losing to Fargo, 4-3. Former BU captain Sean Sullivan, who played for AHL Lake Erie last season, has joined the Straubing Tigers of the German DEL league. In his first six games, Sullivan has a 2-6-8 line. Chris Bourque assisted on two goals for Team USA in a 5-4 win against Switzerland in Deutschland Cup action. The Jack Parker-coached US team plays Germany today for the tournament championship. Freshman Maddie Elia scored twice and added a pair of helpers as BU stretched its winning streak to six games, defeating Maine, 5-1, at Walter Brown Arena. After the Nichols School product evened the score a one apiece in the second period, sophomore Sarah Lefort scored the eventual game-winner on her seventh of the season. Elia added a power play goal late in the second period and sophomore Jordan Juron and senior captain Louise Warren tallied in the third for the final 5-1 margin. Senior Kerry Sperry stopped 21 shots, raising her record to 7-0-1 and lowering her GAA to 1.334. The Terriers and Black Bears conclude the two-game series today with a 3 p.m. puckdrop at WBA. Former Terrier Jenelle Kohanchuk score twice and Jennifer Wakefield added a goal for Canada in its 6-3 win against Finland in the gold-medal game of the 2013 Four Nations Cup in Lake Placid. Also skating for Canada were former BU blueliners Catherine Ward and Tara Watchorn and current Terrier—on leave for this season—Marie-Philip Poulin.